Our goal at Promises® is to help people with addictions and mental health problems create extraordinary lives. 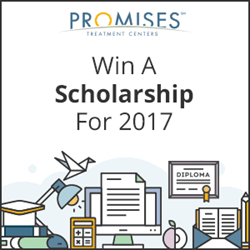 Promises Treatment Centers®, a nationally recognized leader in addiction treatment, invites students to compete in an essay-writing contest for a share of $10,000 in college scholarship funds. Promises Treatment Centers® in Malibu, CA, West Los Angeles, CA, and Austin, Texas are among the nation’s premier addiction treatment centers. Led by some of the country’s leading addiction specialists, Promises® has built an international reputation for innovative addiction treatment and exceptional service. Whether an individual requires detox, residential drug rehab, outpatient treatment, extended care or a sober living environment, Promises has been a drug rehabilitation center of choice for more than 25 years. For more information, visit http://www.promises.com or call (866) 285-9441. Promises Treatment Centers is a member of Elements Behavioral Health, an owner of a series of behavioral health programs located throughout the United States. The Elements Behavioral Health® family of programs offers comprehensive, innovative treatment for substance abuse, sexual addiction, trauma, eating disorders, and other mental health disorders. Through its programs, the company is committed to delivering clinically sophisticated treatment that promotes permanent lifestyle change, not only for the patient but for the entire family network. For more information, visit elementsbehavioralhealth.com.